Even though my husband and I keep talking about empty nest syndrome, our home isn't actually empty yet. My youngest son, With-a-Why, still lives here. (Long-time readers will be shocked to hear that he's twenty years old. Yes. Twenty!) Most days, his girlfriend Shy Smile hangs out here as well. Oh, and they have a friend, Curly Hair, who needed a place to stay for the summer so we invited her to move into one of our upstairs bedrooms. And all my kids still live nearby. My oldest son Boy-in-Black, who comes here often to spend time with With-a-Why, set up a badminton court in the backyard: that's his obsession when he's not playing Ultimate Frisbee. My daughter comes over every evening to "train" with With-a-Why: he's teaching her to play Starcraft, a computer game that he's apparently quite good at. I usually see my son Shaggy Hair Boy on Tuesdays, since we split the veggies and fruit we get from our CSA farm. He's a ninth grade math teacher, who teaches at one school all day and then puts in a couple of hours every evening at another school; he won't be done for the summer for another week or two. The house is less like an empty nest and more like a train station where people come and go: you never know who might be here. I no longer have a teenage boy band jamming in my living room —yes, we gave away the drum set — but we still have live music since With-a-Why is a classical pianist. He's also decided that he wants to learn how to tune a piano, which means that some days I come home to find the top of the piano off and his tools spread out on the floor. The piano tuning was going along quite well until he broke a string. Now he's learning how to replace a piano string. 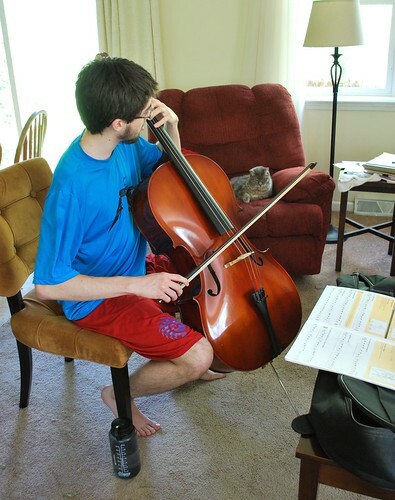 One of With-a-Why's summer projects is to learn the cello. He figures that every composer needs to know a string instrument, and the cello is his favourite. So he rented a cello, and sits down every day to practice. Already he's beginning to play recognizable tunes. I've always lived with live music in the house. My father plays jazz, and when I was growing up, he and his friends would often jam in the house. Once With-a-Why graduates from college and leaves home, I might have to start taking piano lessons again myself, just to have music in the house. OK, so who's getting a phd on the same discipline as my husband, Boy-in-Black? For some reason I thought it was Shaggy Hair boy, but you're saying that he's a teacher -- he's the one getting married in August, right? Is Smiley Girl a teacher too? So is With-a-Why majoring in music? It's awesome that he's tuning the piano, I took a piano technology class (tuning, changing strings, things like that when I was in grad school -- it was an undergrad night class -- but I obviously cannot do any of these things). I hope the string changing went ok! If you have the right tools it's not that bad. At least in a grand piano which is what I was dealing with in that class. As always, a delight to hear updates from your family! Some might suggest your home is being used as a convenience. You might reply, so? I think it is a great way to keep day to day connections with offspring. All that activity would probably be my undoing now that my kids are so ancient and far away and I've grown so used to quiet. However, I do envy you all that built-in live music. L: Yep, that's right. Here are my kids in order of age: Beautiful Smart Wonderful Daughter is a clinical psychologist. Boy-in-Black is a physicist. Shaggy Hair Boy is a math teacher, and he'll be marrying Smiley Girl, who is a science teacher. And my youngest, With-a-Why, is majoring in music. Andrew: My older kids have busy lives so it's not actually that convenient for them to come here, but they come often to spend time with their youngest brother — and because they know I love it when they're home. My parents live six miles away, and I stop by their house often because I know that they love seeing me. We're a close family. You have been blogging a long while! How wonderful that your kids are close at hands. Ours are still in state but not "handy" and we miss them more than we can say! Sounds like a hub of energy in your world. How lovely! Liz: I know! It's a shock to me too. I don't have any teenagers any more. My kids (and my extra kids) are starting to get married, finish PhD's, get real jobs, buy houses, and all of those grown-up things. Where did the time go? Oh my goodness... it has been a long time since I moseyed over to your corner of the internet. I am so glad to find you still writing here. 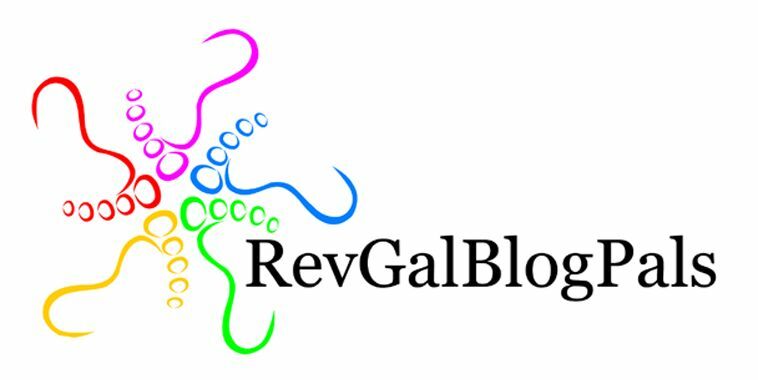 Oh dear... someday this blog [i.e. you] will have "its own" grandkids to come up with pseudonyms for! Awwww... that will be cute! And I know your youngest son will be a wonderful musician! P.S. he already is... of course!